Whole-House Generators: Do You Have One? One simple way to improve your heater’s efficiency is… to use your ceiling fan! Ceiling fans cannot be used to actually cool the air in the room where they are installed. People do leave their ceiling fans on in their homes all day during the summer thinking this helps, but really the room they come home to isn’t any cooler than when they left it. So no, ceiling fans don’t cool the air around them. But they do move air around. Essentially, their core purpose is to create a cool breeze (even cooler when you have an air conditioner running in combination with it). Running your ceiling fan all day, particularly when nobody is home, isn’t going to get you anywhere. Since, again, ceiling fans don’t actually lower the temperature, this means you’d be running an electric device for basically no reason. Ceiling fans don’t eat up a large amount of energy, but they do contribute to the cost of your electricity! Plus, when it is in operation, the motor of your ceiling fan can add heat to the room—which of course isn’t ideal in the summertime. Your ceiling fan can help you save on your heating bills. When you switch your ceiling fan in reverse, it works with your heater to push the heated air that’s risen, down, in order to evenly distribute it throughout the space. This creates a warmer breeze and eliminates your need to have your thermostat as high as you do. As a result, your heater doesn’t have to work as hard, and therefore operates more efficiently. Ceiling fans are a fantastic way to enhance your home’s year-round comfort. They provide versatility, with the ability to be installed in just about any area of your home—bedrooms, the kitchen, a screened in porch, and more. Ceiling fans are both functional and attractive looking, which adds to the appeal of your home. Whether it’s in the summertime or the wintertime, ceiling fans contribute to greater HVAC efficiency. 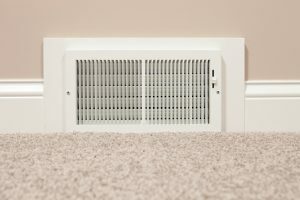 Again, they don’t decrease or increase the temperature of the room on their own, but they do help better circulate the cooled air coming from your AC or in revers help better circulate heated air coming from your furnace. This enables you to adjust the thermostat by at least a few degrees—and every little bit helps. To be sure that your heater works as efficiently as possible, schedule professional maintenance for the system once a year, change the air filter every 1-3 months during periods of use, and make sure you have the right heater for your specific home and needs! ACI Northwest is here to help with your home comfort needs or concerns. Please do not hesitate to contact us for expert heating services in Coeur d’Alene or even just for helpful advice!